It seems ironic that people are sunbathing and wading in the river in the shadow of the still snow capped Rocky Mountains. But this is the contrasting beauty that Breckenridge gloriously displays in the summer. The temperatures are in the 70’s, people are enjoying all manner of outdoor activities and the wonderful weather that graces this historic mountain town. Fly fishing, canoeing, kayaking, biking, hiking, golfing are some of the outdoor sports that Breckenridge boasts. 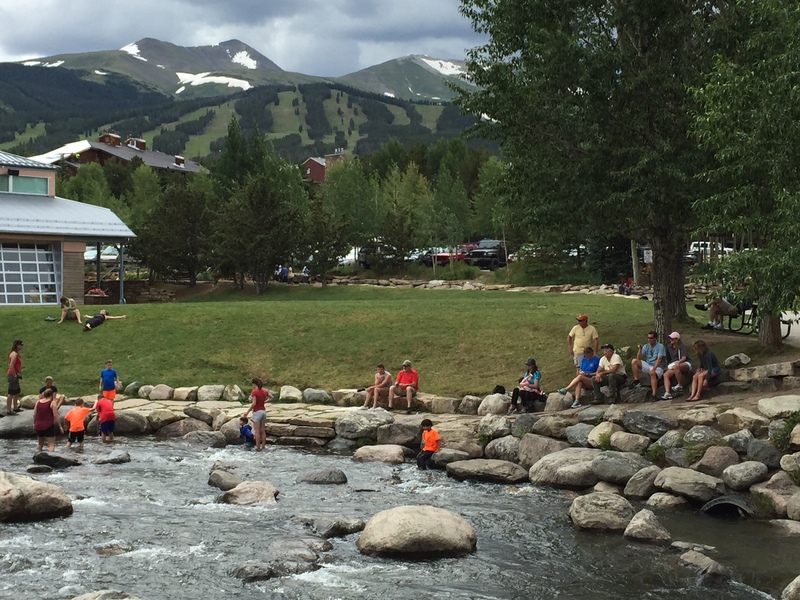 For the less energetic, sunbathing, reading under a tall pine tree, picnicking, playing in the river are wonderful pastimes during summer in Breckenridge. There simply is no “off season” – Breckenridge is truly a four season wonderland of enjoyment. It’s why people come from around the world to this quaint Victorian town to enjoy beautiful scenery, clean mountain air, and the simpler pleasures of life. It’s a great place for families to slow down and unwind together. Fabulous shopping, chef owned restaurants, a charming downtown where people leisurely stroll, it’s all part of the unforgettable ambience of Breckenridge. Want more information? Contact Senior Broker Brent Henry, an award winning fractional real estate specialist. Call Brent at 970-485-2117 or e-mail Brent for complimentary, no pressure information about owning luxury fractional real estate in Breckenridge, Colorado. This entry was posted on August 13, 2016 by elevatemarketingaz. It was filed under Uncategorized .